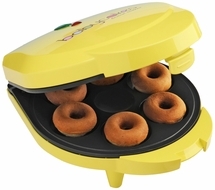 With the Babycakes doughnut maker you’ll enjoy delicious cake-style doughnuts in the comfort of your own kitchen. Bake 6 mini doughnuts in about 4 minutes, then add your favorite toppings or sprinkles. Because the Babycakes doughnut maker bakes donuts instead of frying, the result is a lighter, healthier doughnut that everyone will enjoy. The non-stick coating makes baking and clean up fun and easy. The manual includes a variety of tips and recipes to help you enjoy the baking experience. The doughnut maker features power and ready lights, convenient cord wrap, latching handle and it includes a fork tool and wire cooling rack.